Okay, so you’ve planned your trip to Barcelona, you’ve purchased your airplane ticket, you’ve booked one of the city center Barcelona apartments and you’ve packed your finest swimming gear. Now, the question is: How do you get around the city? Well, Barcelona is one if the best places to visit if long bus rides aren’t at the top of your to-do list and you’re not looking to spend a small fortune on taxi fares. The city is filled with many great types of affordable and efficient public transportation helping you see all the sights easily. Here, we’ve put together a short guide on how to navigate the city, and have a safe and worry-free trip to Barcelona. The Barcelona El-Prat airport is the closest airport to the city center and there are plenty of ways to get straight into the inner limits of the Catalan capital with no messing about! The Aerobús is a service that runs around every 5-10 minutes, giving you a quick ride to and from both terminals of the El-Prat airport. The journey time is around 35 minutes, and either the A1 or A2 bus (depending on which terminal you’re traveling to/from) will pick you up right outside the main airport buildings and drop you off at Plaza de Cataluña in the very city center. The cost of the ticket is about 5,90€ one way or around 10,20€ for a round trip. 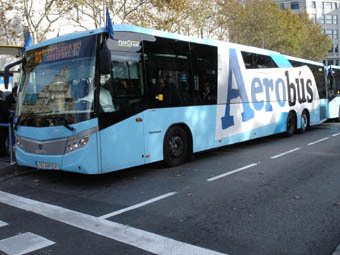 Take a look at the Aerobús website for more information. The Transports Metropolitans de Barcelona(TMB) airport bus (number 46) runs from 5am to midnight and offers the most cost-efficient method of transportation to the heart of Barcelona. If you’re arriving or leaving between the hours of midnight and 5am you can always take the NitBus (number N17), which leaves from Plaza de Cataluña, but be aware that this bus only goes to Terminal 1 of the El-Prat airport. There is also the option to get to the airport by Metro L9 Sud. Taxis offer a more direct route to wherever you need to go and can be hailed at the front of the airport. In addition, Renfe trains run to and from Terminal 2 of the airport every 30 minutes and drop you off at various train stations in the city center. For more information on getting to and from the El-Prat airport, check out our Barcelona Airport Transport Guide. 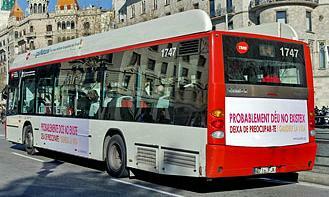 Travelers tip: Save on costs by using your T-10 card (more about this later) on the TMB bus and airport Renfe. 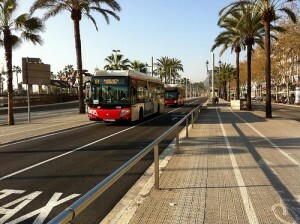 An inexpensive and handy form of Barcelona transportation is the fleet of over 1,000 TMB buses. With more than 100 lines covering over 900km in Barcelona and its surrounding towns, hopping on a bus in Barcelona will definitely get you where you need to go. By using the ‘Going To’ function on the official TMB website, travelers can input their current location and destination to get step-by-step details on which bus to take, from where, and operating times. For those of you who are concerned about not speaking the lingo, don’t worry, the bus system in Barcelona is very easy to use. Simply check the sign at the stop for your route, step on and slide your ticket through the fare machine, then sit back and enjoy the views of the city on the way to your destination. Travelers tip: Take bus 24 from Passeig de Gràcia to Parc Güell to see the amazing views of Barcelona from Gaudí’s famous green space. 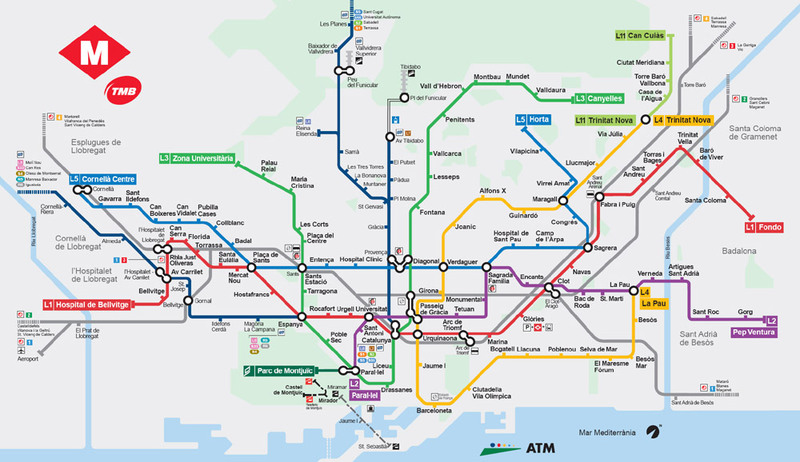 The Barcelona metro operates eight train lines and 165 different stations across the city. Many stations are located next to the biggest landmarks in Barcelona such as the Sagrada Familia (L2 & L5) and the Montjuïc fountain (L1 & L3), so using the metro is a great way to get around town. The metro is also operated by TMB and tickets can be purchased at any of the underground stations. 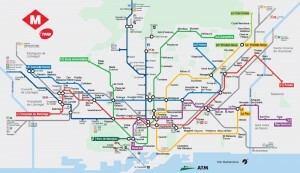 Here you’ll also find train maps showing you all of the routes, as well as which stations have intersecting lines, so you never have to worry about getting lost. Travelers Tip: Be sure to plan ahead as the metro runs until 12am from Sunday to Thursday and until 2am on Fridays. The metro runs all night on Saturdays. Once the day buses stop running, the Barcelona NitBus runs from 10pm to 6am depending on the line. For a fully detailed breakdown of the routes, maps and timetables of all the buses departing from Plaza de Cataluña, check out the official website of the Barcelona Night Buses. Travelers Tip: To explore the seemingly never-ending excitement of Las Ramblas, take metro L3 to Catalunya, Liceu or Drassanes stops. Taxis are easy to come by and with more than 274 taxi stands in Barcelona, taking this form of transportation is a simple choice for travelers looking to make the most out of their time in Gaudí’s city. 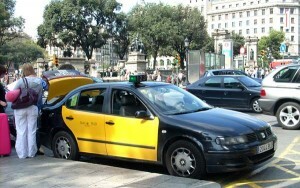 Spotting a taxi in Barcelona is simple, just look for the black and yellow cars zipping through the traffic, then hail a cab with a simple hand gesture or wave. Travelers Tip: When the light is green the taxi is free, and when it’s yellow,red or displaying a number, the taxi is occupied. Why keep your trip within the city limits of Barcelona when it’s so easy to travel to any of the great towns on the outskirts? The Renfe train is a transportation service that allows you to travel all over Spain, but we suggest jumping on board for a daytrip to the picturesque coastal town of Sitges or the Roman ruins of Tarragona. Travelers Tip: The easiest way to purchase a Renfe ticket is by visiting the Renfe website, however, you can also buy tickets at any of the Renfe train stations located in Barcelona, such as Sants Estació, Passeig de Gràcia or El Clot-Aragó. 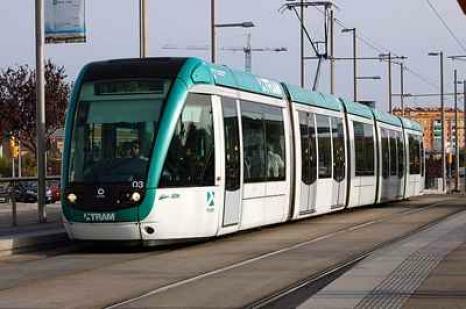 For those looking to venture into the suburbs of Barcelona, the Barcelona Tram runs six lines. T1 –T3 from Plaça de Francesc Macià, and T4 – T6 from various locations along the Barcelona coastline. The trains stretch all the way out to Sant Feliu de Llobregat, Sant Joan Despi, Bon Viatge, Ciutadella Vila Olimpica, Gorg and Sant Adrià. Travelers Tip: All standard TMB transport passes are valid on the Trams too! Previous Article Park Güell – Barcelona’s Colorful Playground!